Udupi,April 19,2017: A Shelter for the Urban Homeless is expected to be ready on 11 cents of land at Beedinagudde here within a couple of months. The building is being constructed at an estimated cost of 40 lakh under the Deendayal Antyodaya Yojana – National Urban Livelihoods Mission (DAY-NULM) scheme. This building will be of great help to those who sleep in bus stands, railway station and in the front yards of business establishments during nights in the city. According to a survey conducted by the Udupi City Municipal Council (CMC) in 2014, 46 persons were found sleeping at bus stands, railway station and other places. This number shot up to 87 in 2015. “Both these surveys were conducted between 11 p.m. and 2 a.m. to get an accurate picture,” said S.S. Narayana, CMC Community Affairs Officer. The survey revealed that an overwhelming majority of those who sleep in such public places were migrant workers. “Four or five were beggars, while no woman was found sleeping in public places during nights,” he said. Most of these migrant workers who come to work in construction and other sectors found it difficult to get rooms or sheds to stay or found them to be too expensive. The Shelter for the Urban Homeless will cater to such persons during the nights. The shelter will have halls for men and women to sleep. There would be 34 beds for men, while there would be 17 beds for women. There would also be a common kitchen and dining hall for the homeless to cook and eat, if they wanted. 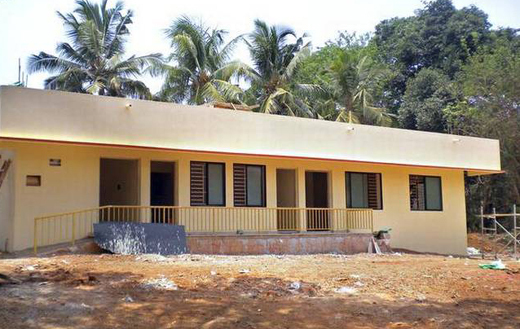 This 1,991 sq ft building would also have solar water facility and toilets and bathrooms for men and women. Those availing of the facility at night cannot use it during the daytime. The facility would be available on first-come first-served basis. “It will provide a safe place for the homeless to sleep at nights,” said D. Manjunathaiah, CMC Commissioner. A non-governmental organisation (NGO) or the CMC itself would supervise the maintenance of the shelter. “We are thinking of providing electricity and cooking gas at the SUH from our biomethanisation plant located nearby,” he said. The construction of the shelter, which began in December, 2016, is now in the final stages.